More than just Cake and Coffee! 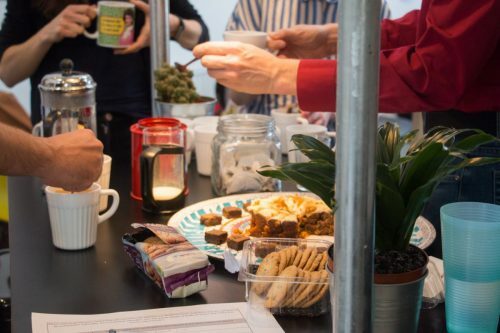 Every Wednesday at 3pm Redbrick House and PAPER Arts hosts it’s well known Cake & Coffee Meetup. Open to everyone, it is the perfect time for our coworkers and those who have joined us to feel inspired and share ideas as well as chowing down on a piece of cake! Lots of members of the public join us for this networking session, and recently we met the lovely Tim Archfield. We found that Tim enjoyed the event so much, that he was happy to oblige when we asked him to write a post about his experience. So, we asked Tim what attracted him to the event, and how did he find his visit to Redbrick House? Leaving a contract position last year as a freelancer was more than a little scary. Writing and editing from home was terrific, but it did lead to me getting a little complacent when it came to keeping my contacts book up to scratch. “No problem”, I thought. I’m an experienced professional – it’ll be easy to get new leads. Little did I know that those are only really acquired face-to-face? Until now I’ve always been lucky enough to be spoon-fed, but this time it’s different: I’m going to have to get out there, meet people and explain what I do. Not exactly my style really: I’m like one of those Apprentice candidates who tells Lord Sugar that he’s not a salesman and ends up getting shoved out of the boardroom by someone with a bigger mouth and no shame whatsoever. I found PAPER Arts through Meetup, though, and thought “why not?” If it was full of people who had nothing in common with me, at least I could stand in the corner and consume hot beverages and baked goodies. My concern about suitability was not entirely unfounded: I’d just spent five years writing about online gaming for a tabloid-style publisher; not a very Montpelier sort of thing to do, really – and something I’d fallen into rather than sought out. Thankfully nobody seemed to mind, and despite most people I met coming from far more virtuous and eclectic professional backgrounds, I made some decent contacts and came away feeling very glad that I’d made the effort. The experience was hugely enhanced by Redbrick House, PAPER Arts’ recently-acquired new home. The place manages to scream youth and creativity at you without actually making any kind of a din, and I did get the feeling I’d be more productive at one of the desks on offer than sat at home. I used to find a true corporate environment hard to concentrate in with so many people around to side-track you, chat and waste time with. Surrounded by other creatives going about their own business wouldn’t present the same problem, though, and the laid-back, productive vibe coming from the desk spaces and meeting rooms seemed way more conducive to getting anything of any real value done. After spending half a decade or so working remotely in my room I’d almost forgotten about the Other Bristol – the vibrant, creative, stylish town that keeps coming top of the Best Places to Live and Work surveys. It hasn’t gone anywhere, and the ongoing success of ventures like this one shows that anyone can be a part of it for a far smaller outlay than you’d imagine.